Today, cyber attacks and infections often involve botnets and their infrastructure. Attacks perpetuated via botnets can be targeted against both regular internet users and speciﬁc organizations. Sophisticated techniques to escape detection (such as advanced cryptography and sandbox awareness) contribute towards the growing numbers of this type of attacks. The majority of botnet victims do not even know that they are infected and continue to operate normally, helping the botnet to persist and facilitating the criminals’ access to valuable resources. 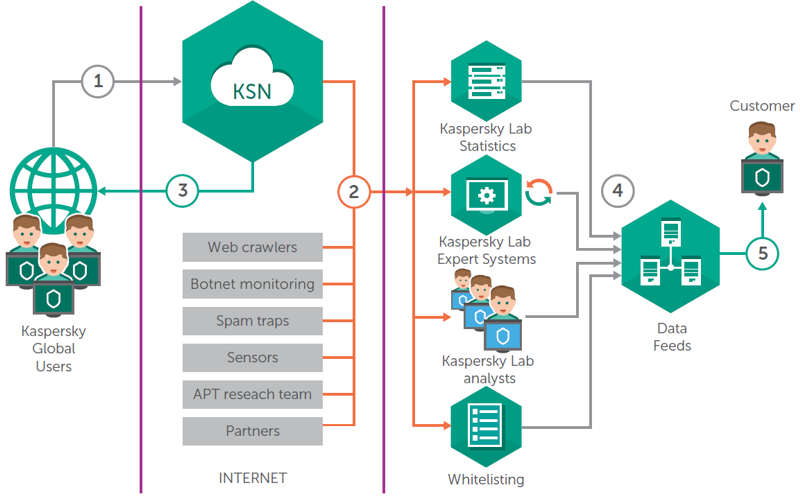 Kaspersky Botnet C&C Data Feeds are well suited for both small network appliances and high-performance mission-critical gateways/servers as well as for content ﬁltering/internet security ven-dors, ISPs and web-hosting companies. It is completely agnostic to software or hardware design and can be successfully implemented on proprietary (non-x86/*NIX) platforms. Leverage intelligence to battle large global botnets without having to invest in complex threat analysis centers and have a global real-time view into malicious activities in botnets. Reinforce your network protection solutions, including Firewalls, IPS/IDS, Security Proxy, secure DNS solutions with continuously updated Indicators of Compromise (IOCs) and actionable context to preemptively strengthen security measures and prevent data breaches. Develop or enhance anti-malware protection for peripheral network devices (such as routers, gateways, UTM appliances) and detect malicious objects by analyzing the network traffic.